J'ai beaucoup aimé notre conducteur de mini van, le groupe était agréable et la journée très belle. Les dégustations et les endroits visités étaient vraiment biens. Par contre, j'ai trouvé que tout allait trop vite et qu'on n'avait pas le temps de profiter de l'activité. Les verres de vins étaient servis les uns après les autres. On n'avait pas vraiment le temps de goûter et d'apprécier. Après on retournait dans l'autobus pour la prochaine dégustation sans avoir eu le temps de visiter l'endroit et prendre nos photos... Ce serait mieux si on nous servait 5 minis verres de vin en arrivant quelque part et qu'on les goûtait à notre rythme. J'aurais préféré qu'on soit assis à des petites tables styles bistro plutôt que debout au comptoir ou en cercle autour des sceaux à surplus qui étaient sur le sol... Mais somme toute c'était une très belle journée avec beaucoup de bonnes personnes! Merci! I cannot recommend this tour enough! Activity Tour's manager, Tish, and our guide, Jim, were both phenomenal. I've never been on such an interactive and wonderful tour. Tish and Jim were so accommodating to our whole group and answered every question with such kindness. The wines tasted were beyond me and I ended up having to make more luggage space for the ones I loved most! The wineries were selected with great taste and the people showcasing their wines were absolutely amazing. 15/10 would tour again. My sister and I did this trip in July and it was wonderful. A hidden bonus of the trip was seeing a group of wild kangaroos as we travelled between two wineries and, for someone not from the area, it was a wonderful highlight! Jim, our guide and driver, was very friendly and knowledgeable. With such a small group 4 in total! he was able to get to know each of our interests and hopes of the trip. We visited three wineries and each as fantastic. Tasted many different types of wine crafted on site, and there was no pressure to make any purchases though many in our group did because the wines were so good and unique. The lunch provided had many options to meet any dietary needs and tastes. The cheese tasting was a bit informal and something I believe any traveller who stopped at the store would also recieve, but the wines were tasty and there was a small cooler in the back of the van that kept any purchases cold for the remainder of the trip. 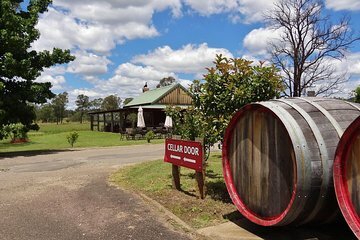 I would highly recommend to anyone who likes wine and wants an easy day trip into the country side outside busy Sydney. We saw Kangaroos!! It was a small group and the guide was very knowledgeable. Enjoyed the day very much and the wine was great!! Excellent tour, tour guide and choice of wineries. Great value for money and a fun day which provided great insight in to the Hunter Valley and boutique wine operation. Great day. Good wines, decent lunch in a nice setting, a little cheese and a little chocolate plus the opportunity to purchase if you liked any of that. O pressure at all though. Pretty scenery, a few kangaroos along the way as well. Our driver/guide was excellent, the van was comfortable and the number in the group was also. All in, well worthwhile. This was an excellent tour, as the group was small enough about 16 people. Our driver was the guide and he did a great job. The wineries we visited gave excellent presentations and the wines were great, and they provided a nice selection of their collection. The lunch was great, too as I had the fish. The cheese and chocolate tasting was okay. This is a great tour with a wide variety of selections of wine and a very interesting guide. If the weather is sunny, it gets perfect with the scenery of Hunter Valley and if you are lucky, you might be able to see wild kangaroos. We absolutely loved our Guide, Jim, with Activity Tours. However, there was only one really great winery we went to. The first winery, our group was stuck in a stifling back room. The third winery didn't have very good wine. I believe the rationale of which wineries we toured was based on the personality of the owners and not the wine itself, which I hope changes in the future. Our Mercedes van's A/C stopped working early on in the tour and our driver tried to get us another van to switch to but his company and/or the van company wouldn't oblige. This made the rest of the tour extremely uncomfortable until the A/C kicked back on with about an hour left on the tour. Overall, gorgeous views, the driver purposefully took us on routes to find wild kangaroos and was very successful!